This is the story of a chair. It all started two years ago when I bought a chair at a garage sale and was so happy to take it home and give it the makeover it deserved. Then I threw it in the garage because I don’t know the first thing about reupholstering furniture. I called around locally to find a place that would recover it… I was looking at over $400. I didn’t need it that bad, so there it sat collecting sawdust. Then I got a crazy thought… maybe I could do it? 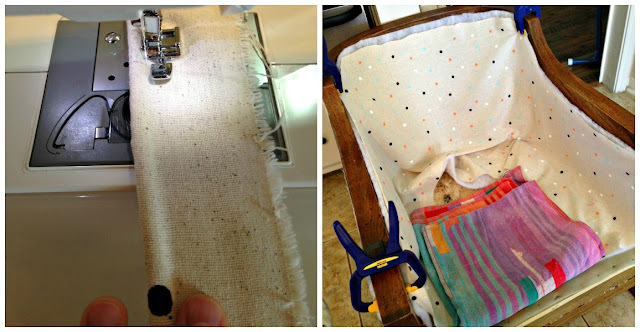 I said to myself- you’re crafty, how hard could it be… get out there and recover that chair. So I drug it inside, And I did it! Probably the most challenging DIY to date! It wasn’t that easy… and now I know why people wanted to charge me $400. It’s not perfect but I have a new chair and I’m glad I challenged myself. Just in case my crazy plan didn’t work I didn’t want to spend a fortune on fabric. When I got the original quotes a few companies told me I would need about 6 yards of fabric, and upholstery aint cheap. I was telling my super smart mom all about my chair and she suggested getting a cheap muslin/canvas and make my own fabric. So that was my first step, props mom :) I got 6 yards of muslin for $2.99 and used my 40% coupon. Then I found a color palette I loved and some small foam pouncers. The trouble was finding where to hand stamp 6 yards of fabric with two little boys on a rainy day. I left our only table to eat on like this for 3 days, my husband loved it :) Sometimes we have to make sacrifices for creativity, right? After I took 1 million pictures of the chair “before” to reference, I started ripping it to pieces. I even posted a pic on Instagram about the OTHER fabric I found underneath. That’s right, this was not its first experience with reupholstering. That orange tweed was on the bottom and the whole inside of the chair. This step also included some “outside time” on a pretty day… after the orange tweed situation there was dust and a smell :/ so I broke out the Lysol and some hot soapy water and went to town. After my fabric was done my plan was to just lay out each piece on the fabric using that as a template, which worked really well. I made sure to take out all of the previous staples that I could. I also used man tools like pliers and clamps :) Then I made yards and yards of piping. Overall, piecing the chair together was really fun, it was just a puzzle then involved a lot of staples. The cushion and the pillow were the only sewing I had to do. The hardest part was that back pillow because it was such an odd shape. The very last thing was the piping, and I just used hot glue because that’s how it was when I took the chair apart. So what do you think? Have you ever reupholstered any furniture? Or does anyone have any tips? 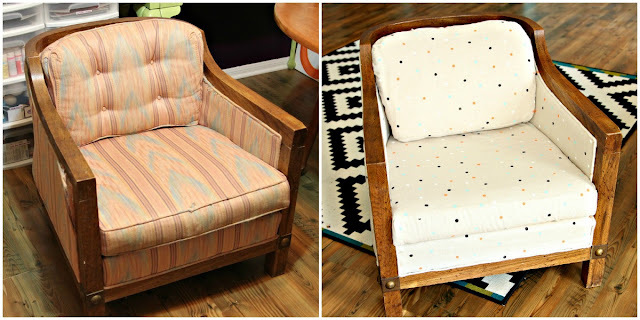 What a great transformation and a brilliant idea – loving this fun patterned chair!!! I am very impressed! I know this must have been a huge project. Job well done! What a great chair! It turned out so good. I haven’t tried reupholstering yet but I am about to start on re-covering an ottoman (tomorrow). P.S. I really love your use of color in your home. Awesome, Awsome job! I have a chair that is an ugly color….The shape is weird and I am real discouraged about reupholstering it. Thought about painting it…don’t know. Its super comfortable though! Such a great transformation! I love that you painted on the fabric so cute! I have yet to reupholster something, but I have thought about it lots! Good job! Woah! What a huge endeavor. I can tell this was A LOT of worth, but the final product turned out so loverly, you should feel very proud. I LOVE that you designed your own fabric, too. This is the ultimate D.I.Y! Great work. Impressive! I re-covered the seats on my kitchen chairs last year (here), and held it all together with tape. (Yes, tape!) 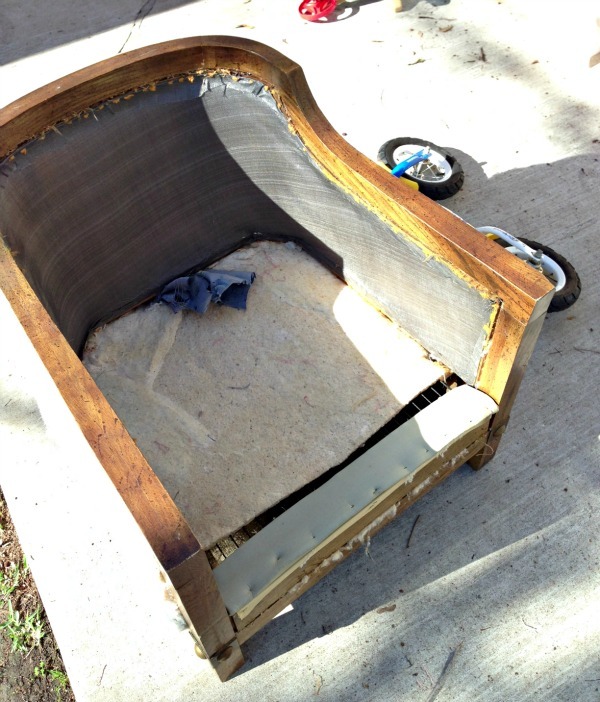 My father-in-law, the upholsterer, took one look at them and brought them to his shop to do the right way, LOL! I really love this idea! In fact I have some muslin that I haven’t felt inspired to use up until now! Thanks for sharing such a great idea!! There are no words for how much I LOVE this chair! Found you on SNAP, new follower. The chair turned out great! Where did you get your curtains or the fabric to make them? I love them so much! You did a great job on this!!!! Great job! I’m in the middle of a re-upholstery job myself and yes, I understand why they charge so dang much!! However, it IS so do-able yourself if you take the time and the photos are KEY!!! I am referring back to them all the time. I love how you created the fabric – what an awesome idea. Your mom is a genius!! I’ve discovered fabric.com and fabricguru.com. Very addictive – makes me want to re-cover anything sitting still!!! Wow, this is an awesome chair now! Love it! wow! This is amazing Taylor. Well done! holy cow. 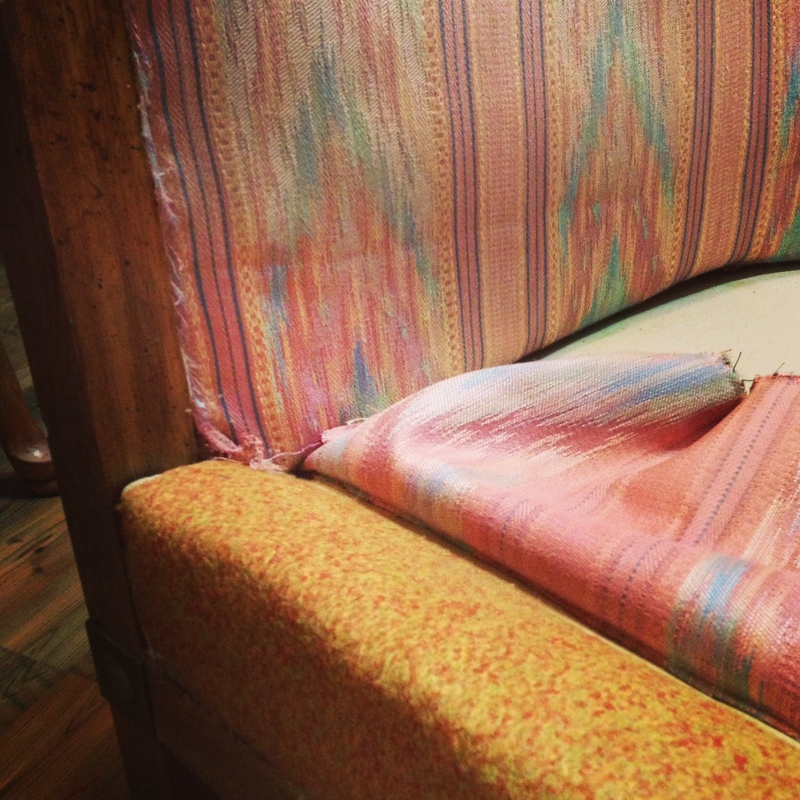 I am so impressed — with the fabric & with the upholstery job! The polka dots on the muslin were a great idea and I love the colors you chose. Pinning! Wow! 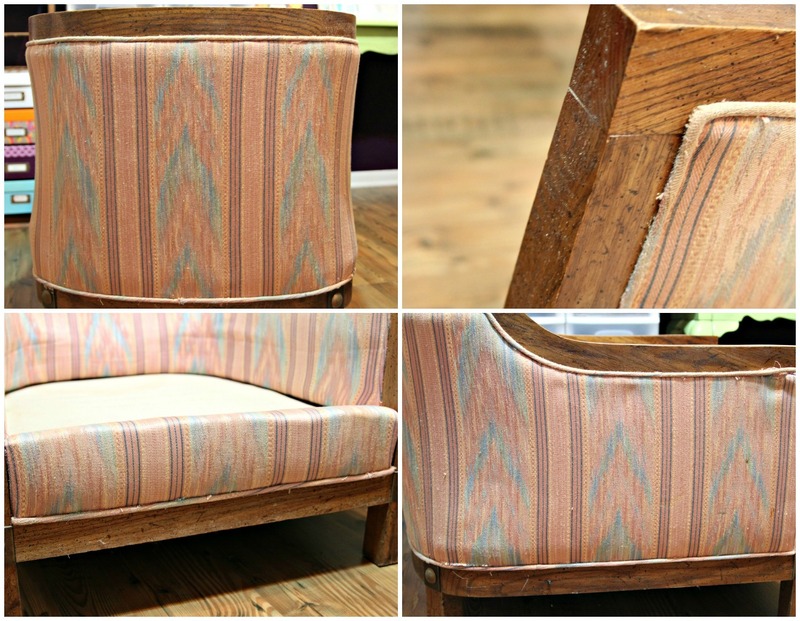 What an amazing makeover for that chair! I wish I had room in my tiny house for projects like this! What a lovely chair! I love the little colorful polka dots, so pretty! this chair is amazing! LOVE that fabric! it’s beautiful and fun! Gorgeous chair! I would never have dreamed that was “cheapo” fabric. I recovered a recliner once, and let me tell you, it’s going to be a long time before I do anything more than a single, flat seat on a beloved wooden chair. :P Lovely job! oh my goodness! i am so excited to start working on the chair that was sitting outside of my neighbor’s house begging for a new home this week, now that i have seen this. awesome! I LOVE THIS! I scored two mid century barrel back chairs last year that had spent their entire existence in a house with cats & cigarette smoke. I haven’t been able to justify paying for someone else to reupholster them, and I just can’t talk myself into getting rid of them either! I had started doing some research on reupholstering them myself, but have still been hesitant because fabric is EXPENSIVE & so much of it is just not my style. I am just over the moon with how this muslin turned out – can I ask where you purchased it, and what weight? Well, not that you need another person to tell you how amazing this chair is…but WOW!!! LOVE IT!! I love that you actually created the design on the fabric too! SO cool! What a great chair!